One complication of a transmural myocardial infarction is rupture of the myocardium. This is most likely to occur in the first week between 3 to 5 days following the initial event, when the myocardium is the softest. The white arrow marks the point of rupture in this anterior-inferior myocardial infarction of the left ventricular free wall and septum. 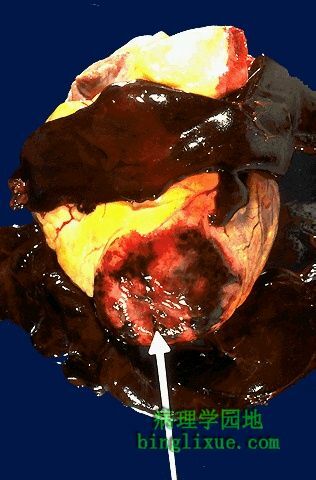 Note the dark red blood clot forming the hemopericardium. The hemopericardium can lead to tamponade.